Actual size of book - H 10" x W 7"
Douglas Winter is a prolific writer regarded as one of the leading experts in the field of United States gold coins. This edition of Gold Coins of the Dahlonega Mint includes new data and updated knowledge about these rare treasures and the rich history behind the mint that coined them. 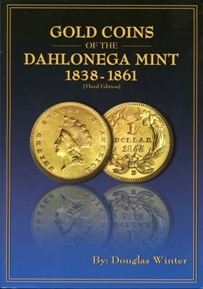 The Dahlonega Mint, located in north Georgia, produced gold coins from 1838 until it closed in 1861. The four denominations from Dahlonega rank as some of the most popular and sought-after coins in the marketplace. Entirely new condition census information. New information on Dahlonega die varieties.